Suitable for use with the Orton-Gillingham Approach and programs based on similar principles. How to assemble: Print on card stock, cut, and laminate for durability. Hole punch upper left hand corner and attach to metal ring. A variety of sentences and red words are included to use for differentiation. Print in b/w to avoid red words being highlighted. I like to highlight the red words to remind students that these words are not phonetic and therefore can not be sounded out. 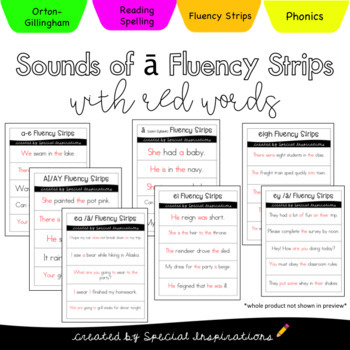 Great addition to your literacy centers, lessons, and/or tutorial sessions.